Senara is pleased to introduce Z Wave Cellulite treatment to our non-invasive body contouring services. Whether used alone or in conjunction with CoolSculpting (fat freezing), Z Wave treatment is an effective treatment to improve the appearance of cellulite deposits on the buttocks, thighs, abdomen, and arms. The Z Wave is FDA cleared for the temporary reduction of the appearance of cellulite. Typical patient treatment time is 3-4 minutes per body zone. Patients may notice visible results after only 2-3 sessions. You may also use the Z Wave as an adjunct in CoolSculpting treatments to enhance body contouring results. The Z Wave constitutes the latest development in the treatment of cellulite. It uses soft pulse technology to enhance patient comfort. Mild, consistent sound wave therapy is delivered to the treatment area over a series of treatment sessions. The Z Wave unit transmits powerful sound waves onto and through the skin. This energy is delivered via an electromagnetic applicator, then spreads out radially. (Picture the gentle radial waves generated when dropping a pebble into a still pond.) This radial energy enhances the treatment effect to improve the tone, texture and appearance of the cellulite. The body responds to the Z Wave Pro sound waves with increased metabolic activity in the form of lymphatic drainage and increased blood circulation. The end result is an improvement in the appearance of cellulite. Ask your Senara body contouring specialist about the Z Wave Pro and how it can help you! Schedule an appointment today! Cellulite is defined as a condition in which skin appears to have areas with underlying fat deposits, giving it a dimpled, lumpy appearance. Nearly 90% of women and 10% of men will develop areas of cellulite. This includes people who are otherwise slim and fit. Cellulite usually begins to appear between the ages of 25 and 35 as estrogen begins to decrease. Exercise does not get rid of cellulite. One can reduce fat, but this does not effect the herniated fibers that cause cellulite. Losing weight doesn‘t make cellulite disappear. Drug store creams have not been shown to have significant effect to reduce the appearance of cellulite. Z Wave is used as a “stand-alone” application or in combination with body contouring treatments. As a “stand-alone” application, the focus is on improving the appearance of cellulite. Is the Z Wave treatment painful? No, quite the contrary. Many patients comment that the Z Wave treatment feels similar to a relaxing massage. For cellulite treatment: Visible changes may be seen as soon as during your second week of treatment. Your skin will get smoother and noticeably firmer. Recommended treatment is a minimum of 10 sessions within a 3-4 week period. The number of treatments you need may depend on the severity of your cellulite. For enhanced body contouring: It depends on your specific condition. For example, Z Wave after CoolSculpting typically requires only one treatment, instead of massage. The Z Wave treatment takes about 4 minutes per treated area. For enhanced body contouring: Z Wave will enhance the experience and outcome of your contouring procedure. 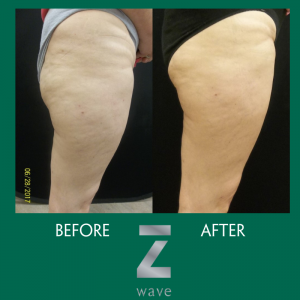 How long will the effects of my Z Wave treatment last for the treatment of cellulite? Z Wave practitioners have reported that the effects have lasted a year or more. What are the advantages of Z Wave? For cellulite treatment: Z Wave is an effective treatment for cellulite that is gentle, quick, and noninvasive with no down time for the patient. For enhanced body contouring: Z Wave is an effective treatment to enhance body contouring results, can shorten recovery time and minimize the occurrence of side effects. How does Z Wave compare to hand massage after a body contouring procedure? Z Wave lends consistent therapy for the entire treatment, removing the subjectivity of hand massage.